The wife and I just returned from Paris, Portugal, and Spain. Unfortunately, on the polished smooth tiles of Lisbon, she slipped and snapped her left fibula. We Americans don’t take kindly to instruction from abroad. As a nation, as a society, even we find ourselves baffled at times, unable to see ourselves clearly, either peering through a glass darkly on the one extreme or through rose-colored glasses on the other. In light of this, I would recommend spending a month or so overseas, at least once in a lifetime, targeting Europe in particular; the scales can literally fall from all too jaded eyes. My wife, Carol, and I just returned from Paris, Portugal and Spain. Unfortunately, on the smooth polished tiles of Lisbon, she slipped and snapped her left fibula on a curb. That she struggled on with my assistance for a full week is now the stuff of legend on both sides of the Atlantic. Finally in Vigo, Spain, on the orders of a Kaiser Permanente consulting nurse, we took a taxi to the emergency room of a small half-public, half-private (we later learned) hospital. As wayward Americans are rare in Vigo, fellow queued-up Spaniards adopted us, urging us to go forward to engage the receptionist, and a young man, Sergio, rushed over from his seat in the waiting room to help translate. In a rather bleak, bare-walled facility, we were treated by three or four marvelous doctors, guided through a series of examinations, X-rays and re-examinations, until a splint (half a cast) was applied to the wounded leg (a full cast would have prevented boarding a flight home, and surgery was ruled out as the least conservative option). Once a final X-ray confirmed that the two completely separated ends of the fibula were in correct alignment, we were discharged, with heartfelt goodbyes exchanged all around. Needless to say, a Spanish citizen would have paid nothing. As a Kaiser Permanente team later removed the splint to replace it with a more versatile plastic version, they assured us: “They did exactly as we would have were you home in Seattle.” Aside from the royal service, in that Vigo hospital my wife couldn’t help but notice that the X-ray machine was old-school, perhaps five or 10 years behind the new technology. No matter, their hearts and minds were in the right place. So was the fibula. Back in our Airbnb, we watched France win the World Cup over Croatia. No doubt the American television coverage concluded soon after, as the award ceremony did not immediately follow the end of the match, nor was it brief. What you all missed! Even the Spanish channel went right on undeterred. Unlike the American Super Bowl, both teams were honored. There was not one “most valuable player” but two, one from each team. And with the exception of one world leader, they all received elaborate congratulations — hugs and kisses — from the dignitaries and President Emmanuel Macron from France and President Kolinda Grabar-Kitarovic from Croatia (who flew economy class with fellow fans to the early rounds in Sochi). 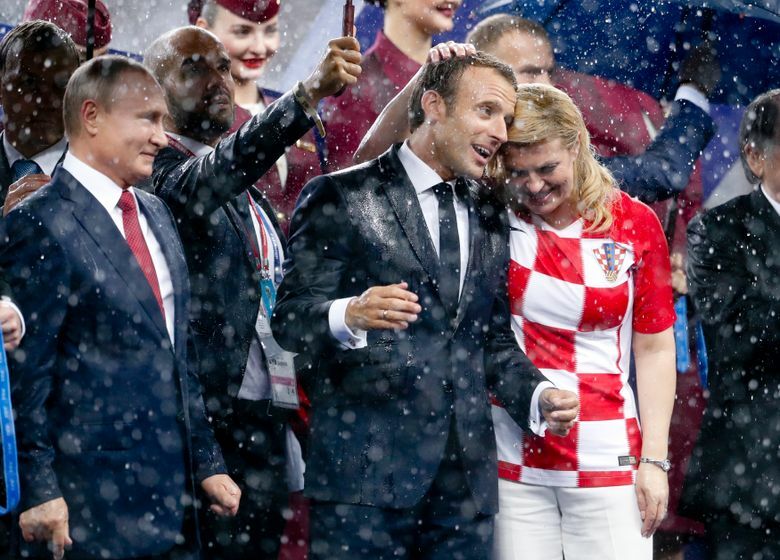 As the rank-and-file players from teams both moved past, Macron grasped the heads of several players from both teams and kissed them unabashedly, as did the Croatian president. Russian President Vladimir Putin merely shook hands. When the rain turned into a downpour, drenching literally everyone, only one member of the reviewing stand received his own bodyguard holding an umbrella over him. Guess who? Later, in all fairness, help did arrive, belatedly, for the others, for even Putin apparatchiks recognize unflattering optics. But no matter: When genuine joy and affection rain, they do indeed pour, undisguised and undiminished. Along with the revolutionary Portuguese approach to drug addiction (decriminalization, et al), and the Spanish technique of preventive forest fire management, let alone that we would do well to try to preserve or emulate the kinds of traditional cultural idioms and values that appear to underlie the sense of community and personal safety of most Spanish cities, we have a few things to learn from the Europeans. Michael F. Sparks is a retired academician and schoolteacher whose book, "Rage Against The World: Paradise Joe’s, Seattle Pacific, Evangelical Religion, and American Culture" will be published in 2019.